Democrats Win House Control But GOP Retains Senate Majority Democrats had a big victory — retaking the majority of the House for the first time since 2011. Senate Republicans expanded their Senate majority, with President Trump helping in key red states. 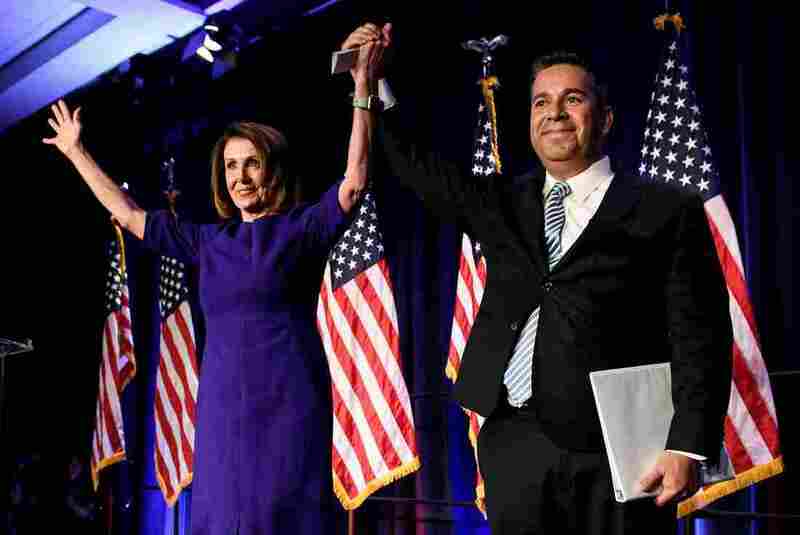 House Democratic Leader Nancy Pelosi, D-Calif., and Rep. Ben Ray Lujan, D-N.M., Democratic Congressional Campaign Committee chairman, celebrate. Republicans and Democrats will split control of Congress next year. House Democrats are projected to pick up enough GOP-held seats to take the majority in the House, according to The Associated Press. Senate Republicans are projected to maintain and perhaps expand their majority. The results create a divided Capitol Hill next year and mean President Trump's plans for new tax cuts, tougher immigration legislation and changes to the Affordable Care Act will be blocked. House Minority Leader Nancy Pelosi, D-Calif., declared victory late Tuesday night and Trump called her to congratulate her on the win. "We have all had enough of division. The American people want peace; they want results; they want us to work for positive results for their lives," Pelosi said at an election night celebration with top House Democratic leaders. And after Trump's concentrated focus on rallying in the final weeks of the campaign, Senate Democrats in several red states suffered projected losses. The GOP is poised to enlarge its majority by at least two seats. Republicans will maintain control of the Senate for at least two more years, after Democratic losses in Indiana, Tennessee, Texas, North Dakota — states that Trump won by double digits in 2016. The president campaigned aggressively in those states. Senate GOP leaders capitalized on a battleground map that left Democrats defending 26 seats, including 10 in states Trump won in 2016. Now they must defend Trump's hard-line rhetoric and policy on issues like immigration and trade, despite tensions within the party over those same issues. Trump was not on the ballot this year, but the midterm election was viewed as a nationwide referendum on his leadership. Now, leaders from both parties will pursue vastly different agendas on Capitol Hill. Democrats in the House vow to launch wide-ranging investigations into Trump, his business dealings and the transparency of his administration. Republicans in the Senate will continue to install more Trump nominees to the federal judiciary and defend the president and his policies. Pelosi's spokesman, Drew Hammill, tweeted late Tuesday about the phone call between the president and the House minority leader: "President Trump called Leader Pelosi at 11:45 p.m. this evening to extend his congratulations on winning a Democratic House Majority. He acknowledged the Leader's call for bipartisanship in her victory remarks." A divided Congress is likely to extend the heated battles of the 2018 campaign into the presidential election in 2020. Early vote data released early Tuesday indicated that the electorate was younger and more diverse than in the last midterm election. Turnout levels were significantly higher across several demographic groups, and up in states with competitive Senate contests — Arizona, Texas and Nevada. The president's impact played out differently in the roughly 80 competitive House races and more than a dozen close Senate contests. Demands within the Democratic Party will test the power and influence of leaders like Nancy Pelosi, who plans to seek another term as speaker of the House. Democrats pinned their hopes for retaking the House on boosting turnout among women and minorities and wooing moderate suburban voters who were turned off by Trump. They focused on recruiting diverse candidates that might have once seemed outside the box for the party. That included gun owners and military veterans — and a lot of female candidates. The strategy was well-tailored to turn out voters for House seats, and a record number of women will be sworn in early next year. But the election also likely means Democrats will have to bridge the demands of a party that has grown to embrace progressives, like Alexandria Ocasio-Cortez, who won in a safely Democratic district in New York, while electing moderates like Conor Lamb in Pennsylvania, who won a special election earlier this year and won Tuesday in a reconfigured district. Such a Democratic caucus will test the power and influence of leaders like Pelosi, who plans to seek another term as speaker of the House. 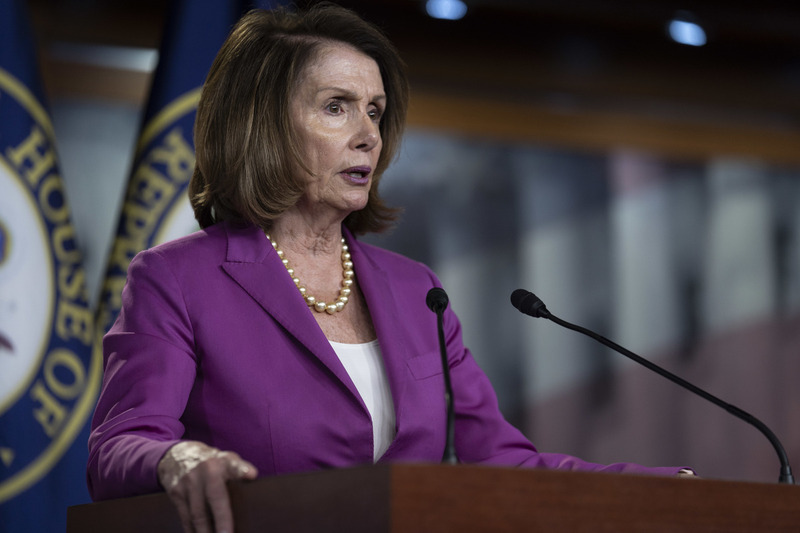 Pelosi has been criticized by a vocal group inside the caucus as being out of touch with her changing party and unwilling to provide opportunities to newer members. She was the subject of millions of dollars in Republican attack ads this cycle, forcing more than a dozen candidates to publicly vow not to support her for speaker. That divide could make it difficult for House Democrats to unify around an agenda. There will be pressure from her most progressive flank to vote on proposals like a "Medicare-for-all" health care plan. But Pelosi has promised to focus first on government and campaign finance reform measures. "When we win, on the opening day, our Democratic Congress will be open and transparent," Pelosi said at an event Tuesday morning. Republicans will have to battle an opposite trend. Many moderate members chose to retire rather than face tough re-election campaigns. With the bulk of the competitive races focused in suburban districts, GOP candidates and leadership aides worried the president's tough rhetoric about immigration may have turned off women and independents in those areas. House Speaker Paul Ryan appealed to the president the weekend before the election to focus on the strong economy and benefits from the 2017 tax cut. While Trump did boast about these accomplishments, he continued to emphasize his push to crack down on the "caravan" — the group of Central American migrants heading toward the Mexican border with the United States. He also declared he would end birthright citizenship with an executive order — a proposal Ryan said would be unconstitutional. House GOP leaders are expecting to oversee a more conservative conference next year, with many of their losses coming in seats held by centrists. That tilt to the right is likely to mean even more pressure by top leaders for members to stick together to vote on legislation that is closely aligned to Trump and his agenda. 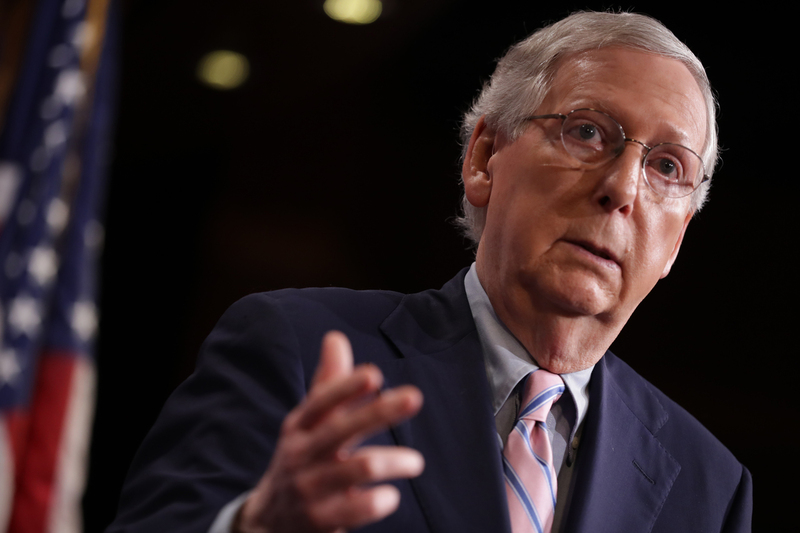 Republican Senate Majority Leader Mitch McConnell of Kentucky talks to reporters after the Senate voted to confirm Supreme Court nominee Judge Brett Kavanaugh on Oct. 6. Senate Democrats had faced a steep challenge as they fought to keep seats in states Trump won by double-digit margins in the worst battlefield for any party in modern history. Just six Republicans were up for re-election; all but one of them ran in safely Republican states. Democrats landed on a plan to allow each vulnerable Democrat to run an independent campaign without a unified platform. For example, Heidi Heitkamp in North Dakota could stump on protecting farmers while Joe Manchin in West Virginia promised new health protections for coal miners. But Republicans had the advantage of simply reminding their base of all of the times Democrats voted against Trump. Heitkamp reached out to Trump White House officials and attempted to craft a bipartisan posture, but she voted against Brett Kavanaugh's nomination to the Supreme Court. And other red state Senate Democrats running for re-election — Claire McCaskill in Missouri and Joe Donnelly in Indiana — did the same. Trump personally played a significant role in tight Senate contests in the closing weeks of the election cycle. He traveled to Indiana, Florida, Montana, Nevada, Missouri and Mississippi — and in some cases landed in dramatic fashion aboard Air Force One to crowds of supporters enthusiastically cheering his red-meat speeches focused mostly on immigration and warnings about what Democratic control meant for his agenda. His visits included overt reminders to his base supporters that they weren't just voting for any Republican on the ballot — they were voting for senators promising to back his priorities. "They want to raise your taxes, the Democrats do, restore crippling regulations, shut down your new steel mills, take away your health care, and put illegal aliens before American citizens," Trump said in a closing rally in Indiana on Monday. "If you want more caravans, if you want more crime, vote Democrat tomorrow." Democrats benefited from a flood of donations to official party organizations and outside groups working on their side. Democratic candidates and their outside supporters are expected to spend more than $2.5 billion on this year's election, according to the Center for Responsive Politics. Republican candidates and their backers are on track to spend $2.2 billion. Fundraising in 2018 far outpaced what is normal for a miderm election. Both parties saw dramatic surges in donations that were closely correlated with national political events like the hearings on sexual assault allegations during the confirmation of Kavanaugh. Donors responded to heated political battles, like funding a wall on the border with Mexico and Republicans' failed attempts to repeal the Affordable Care Act, by flooding candidates with cash.